Our developers have been hard at work, and as a result, you can now see the changes editors have made to your email. Also, you can communicate to our editors to tell them what you think of their work, and our editors can send you comments about details in your finished message. Our previous “Before” and “After” system was a bit buggy, and the visual differences you saw (diffs) weren’t always accurate. We’ve made some improvements so that the diff is more accurate and readable, showing you exactly what’s been changed. Your “Wordzen Complete” email now contains a rating system, so you can rate each email we edit on a scale from “Horrible” to “Excellent.” You’ll also be able to leave comments about what you specifically liked and/or didn’t like. Feedback means everything to our editors, so while you don’t have to rate every email, please rate frequently. When your email is particularly lengthy or difficult, our editors might send you a notification informing you that your message will take more than the standard ten-minute timeframe and estimate when your message will be ready (15 minutes, 25 minutes, etc.). This allows you to continue working on other tasks rather than waiting at your computer for your email to be ready. There are any number of reasons our editors might need to communicate with you, which is what makes Wordzen so special. 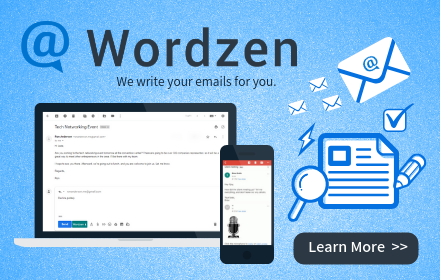 By using Wordzen, you receive personalized review and advice from human editors. This isn’t just about grammar — it’s about writing the perfect message for any situation.